2018's first Ozone Action Day - what does it mean? PHILADELPHIA (WPVI) -- Last week, you were still wearing a winter coat. This week, it's time for summer clothes - and concerns about hot weather breathing problems. The Air Quality Partnership has declared today an Ozone Action Day, which occurs when weather conditions are likely to combine with pollution emissions to form high levels of ozone near the ground. That ozone can have harmful health effects, especially for vulnerable people like the very young, elderly, and those with chronic heart or breathing conditions. People and businesses are urged to take steps to reduce ozone-causing emissions. The area's first Ozone Action Day happens to come in the middle of EPA Air Quality Awareness Week. Ozone above the federal standards is likely to form with high temperatures, light winds, no rain, and/or a wind direction blowing in polluted air from another area. Delaware Valley residents should be especially concerned, because air pollution in the area has been getting worse, not better, in recent years. Philadelphia and the 5 surrounding counties earned an 'F' grade in the 2018 State of the Air report card from the American Lung Association. 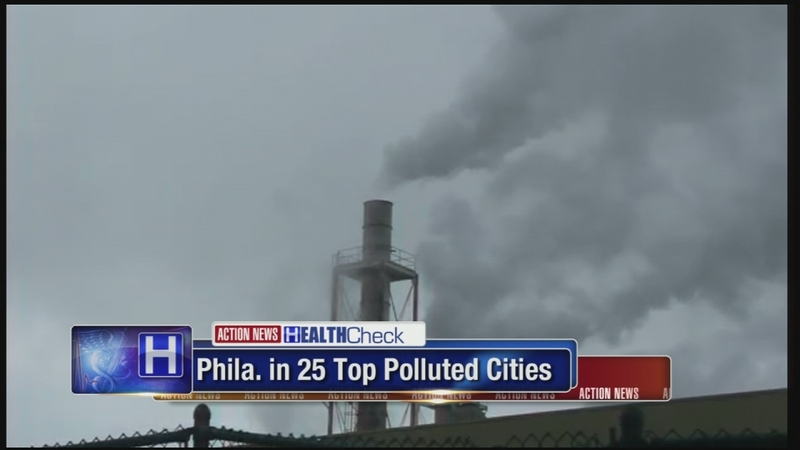 Philadelphia is the nation's 24th worst city for high ozone days, according to the Lung Association, and 12th out of 187 cities for annual particle pollution. It also ranked 31st out of 201 cities when it comes to 24-hour particle pollution. The study also found that overall, ozone pollution has worsened significantly in America from 2014-2016 compared to its previous report, which looked at 2013-2015. * Conserve electricity and set your air conditioner at a higher temperature. * Choose a cleaner commute -- share a ride to work or use public transportation. Bicycle or walk to errands when possible. * Refuel cars and trucks after dusk. * Combine errands and reduce trips. * Use household, workshop, and garden chemicals in ways that keep evaporation to a minimum, or try to delay using them when poor air quality is forecast. * Conserve energy -- at home, at work, everywhere. * Follow gasoline refueling instructions for efficient vapor recovery. Don't top off your tank! Spillage adds 2 tons of pollution to the air EVERY DAY. * Clean out your trunk. An extra 100 pounds wastes fuel and reduces gas mileage by 2%. * Maintain your car. Properly inflated tires can improve gas mileage by 3%. Regular oil changes can boost it by 1-2%. * Carpool, use public transportation, bike, or walk whenever possible. * Keep the engines in lawn equipment tuned. They pollute, too. * Use environmentally safe paints and cleaning products whenever possible.